Magnetic Island Magpies - Juniors, Living & Playing in Paradise. The Magnetic Island Magpies Junior AFL Club is a great way for kids aged 6-12 years old to be in...volved in a team sport on our tropical island Maggie. We are based at the Horseshoe Bay sports complex with a full size oval sporting permanent AFL posts. We train on Tuesday afternoons and play home games here on Maggie, or away games just a 20 minute ferry ride away in Townsville on Saturday mornings. 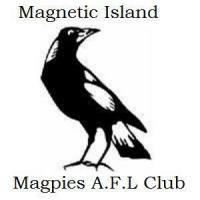 Join the facebook page at: Magnetic Island Magpies Junior AFL Club.